The foolish reasons it bans guns as "AWs." Consider the two AR-15s below. The ban says that the one on the top is an AW, because it has a pistol grip, a flash suppressor on the end of the barrel and a bayonet mount under the front sight. The ban says that a semi-automatic rifle that uses a detachable magazine is an AW if it has more than one attachment. The AR-15 on the bottom is not an AW, because it has only one attachment. Absurd. The attachments have nothing to do with crime. (Anti-gun groups' fearful descriptions of them are ridiculous.6) The mere shape of a grip? A flash suppressor? And when was there a crime with a bayonet on a rifle? Moreover, the attachments are common to tens of millions of other guns. All pistols have "pistol grips," obviously, as do all revolvers and many rifles and shotguns, about a third of Americans' 200+ million guns. Several million other rifles have bayonet mounts.7 Tens of millions of rifles, pistols and shotguns are semi-automatic and/or use a detachable magazine. "The banned weapons and magazines were never used in more than a modest fraction of all gun murders." 12 straight years of "more guns, less crime." Since 1991 (three years before the ban), the nation's violent crime rate has decreased every year, 35% overall, to a 27-year low, according to the FBI.15 According to federal crime victim surveys, violent crime is at a 30-year low.16 Meanwhile, the number of privately-owned guns, including hundreds of thousands of AWs and nearly identical guns (like those shown on p. 1), has risen by more than 60 million.17 The number of "large" magazines has risen by 50 million since 1994.18 Today, there are more guns (including more AWs19) and "large" magazines than ever. Gun-ban supporters predicted crime would increase, but they were wrong. Anti-gun lobby claims about firearm commerce traces are false. Before the ban, they claimed AWs were often used in crimes, because they were often traced.20 Now they claim that AW traces have decreased, so the ban must have reduced crime.21 Both claims are bogus. Most guns that are traced aren't used in violent crimes, and most guns used in violent crimes aren't traced. The Congressional Research Service reports, "Firearms selected for tracing do not constitute a random sample and cannot be considered representative of the larger universe of all firearms used by criminals." "No crime need be involved. No screening policy ensures or requires that only guns known or suspected to have been used in crimes are traced. "22 The study for Congress (see p. 1) noted, "because the banned guns and magazines were never used in more than a fraction of all gun murders, even the maximum theoretically achievable preventive effect of the ban on gun murders is almost certainly too small to detect statistically." And the ban couldn't have had an effect on crime, because the attachments it banned have nothing to do with crime. Finally, AWs account for a smaller share of traces today because they are no longer a hot issue (there is less interest in tracing them) and BATFE now encourages traces on other guns. "Gun control" supporters' contradicting claims. They claim that the ban has been effective--that it reduced crime by banning guns23--and for that reason should be extended past its scheduled expiration date. But they also claim the ban didn't ban guns, but instead merely put a one-attachment limit on new guns.24 Therefore, they say, the ban should be expanded (rewritten) to define "assault weapon" in a way that bans guns, not just attachments. The truth is, the ban should not be extended or expanded. As shown above, the guns in question (those with one attachment and those with more than one) were, and are, rarely used in crime, even though there are more of them today than ever. And as explained on pp. 3-4, the ban also infringes the right to arms for defensive purposes. An illegitimate question: "Who needs an assault weapon," the anti-gun lobby asks. The premise of that question is, however, at odds with basic American principles. In a free society, the burden of proof is not upon those who wish to exercise rights, it is upon those who wish to restrict rights. Therefore, gun-ban supporters must show why the guns should be banned, and thus far they have not done so. It is clear that the guns are rarely used in crime, and rarely does the criminal's choice of gun determine the outcome of his crime. AWs have the same functional traits, and use the same ammunition, as other guns. Contrary to anti-gun lobby claims, "AK-47s and Uzis" won't "flood the streets" when the Clinton ban expires.25 Since AWs aren't often used in crimes (see p. 1), there was never a "flood" of AWs, let alone of two particular models. Moreover, foreign rifles like the AK-47 and Uzi were prohibited in 1989 under firearm importation law,26 which is more restrictive than the Clinton ban.27 "Assault pistols" were prohibited from importation in 1993. Street Sweeper and Striker-12 revolving cylinder shotguns, and the USAS-12 semi-auto shotgun, were restricted under the National Firearms Act28 six months before the Clinton ban. When the Clinton ban expires, all of those guns will remain prohibited under those other laws. "Gun control" supporters are lying about police officers. The Violence Policy Center (VPC) claims that between 1998-2001, one of every five police officers killed in the line of duty was killed with an AW.30 However, based upon information reported by the FBI,31 it is clear that in most of the crimes to which VPC refers, AWs were not involved. Not mentioned by VPC, many of the killers have prior arrests and convictions, begging the question of why they were not behind bars. In one case, the gun used was not an AW, and the killer had a long criminal record, including a conviction for armed robbery after a shootout with police. AWs are functionally identical to millions of other guns. About 15% of Americans' guns--upwards of 30 million guns--are semi-automatics. Also, AWs use the same ammunition as other guns, so they are neither more powerful, or less powerful, than other guns. The ban infringes the right to defense. The right to arms includes hunting and sports, but is primarily a defensive right.38 The U.S. constitution and most state constitutions declare "security" or "defense" as the reason, or one reason, for guaranteeing the right.39 Each state's laws recognize the right to arms for defense. The right belongs only to individuals,40 and the Supreme Court has noted that it includes arms that relate "to the preservation or efficiency of a well regulated militia,"41 which, obviously, includes service rifles like the Colt AR-15 and Springfield M1A, semi-auto shotguns, and other AWs. The ban's 10-round magazine limit limits your ability to defend yourself. Police officers and military personnel use standard magazines42 for good reason--their protection. Private citizens should have the same ability to defend themselves. The study for Congress and a follow-up study (see p. 1) found no justification for a limit on the number of rounds in new magazines, let alone the arbitrary number "10." The Clinton Gun Ban vs. National Defense. Americans have owned military-style firearms throughout the history of our country. Today, millions of Americans own AR-15s and M1As, the semi-automatic versions of our military service rifles. And with the war on terrorism abroad and security increased at home, it is worth noting that 45% of military personnel are Reservists and National Guardsmen, and 346,664 have been mobilized as of January 8, 2004.43 Many Reservists and Guardsmen maintain readiness by training with personally-owned AR-15s when they are in civilian status. The Clinton Gun Ban affects commonly-used target rifles. Since 1905, the federal government has supported civilian training with defensive arms through the Civilian Marksmanship Program (CMP) and sales of surplus military rifles and ammunition to shooting clubs and their members who train and compete. 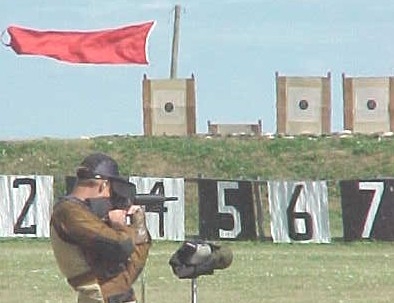 In 2003, the CMP marked the 100th anniversary of the National Trophy military rifle and pistol matches, authorized by Congress in support of national defense. 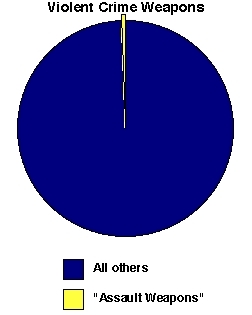 Civilians account for 80% of competitors. The most common rifles are the Colt AR-15 and Springfield M1A, both of which are affected by the Clinton Gun Ban. National Trophy Matches is the AR-15. 1. Ann Devroy, "President Rebukes Rifle Association," Washington Post, March 2, 1993, pg. A9. 2. 18 U.S.C. 921(a)(30) "'Semiautomatic assault weapon' means any of the firearms, or copies or duplicates of the firearms in any caliber, known as: Norinco, Mitchell, Poly Technologies Avtomat Kalashnikovs (all models); Action Arms I.M.I. UZI and Galil; Beretta AR-70 (SC70); Colt AR-15; Fabrique Nationale FN-FAL/LAR, and FNC; SWD M-10, M-11, M-11/9, and M-12; Steyr AUG; Intratec TEC-9, TEC-DC9, and TEC-22; and revolving cylinder shotguns, such as (or similar to) the Street Sweeper and Striker 12; semiautomatic rifle that has an ability to accept a detachable magazine and has at least 2 of: a folding or telescoping stock, a pistol grip that protrudes conspicuously beneath the action of the weapon; a bayonet mount; a flash suppressor or threaded barrel designed to accommodate a flash suppressor; and a grenade launcher [never supplied with AWs]; a semiautomatic pistol that has an ability to accept a detachable magazine and has at least 2 of: an ammunition magazine that attaches to the pistol outside of the pistol grip; a threaded barrel capable of accepting a barrel extender, flash suppressor, forward handgrip, or silencer; a shroud that is attached to, or partially or completely encircles, the barrel and that permits the shooter to hold the firearm with the nontrigger hand without being burned; a manufactured weight of 50 ounces or more when the pistol is unloaded; a semiautomatic version of an automatic firearm; and a semiautomatic shotgun that has at least 2 of: a folding or telescoping stock; a pistol grip that protrudes conspicuously beneath the action of the weapon; a fixed magazine capacity in excess of 5 rounds; and an ability to accept a detachable magazine." 3.18 USC 921(31): "'Large capacity ammunition feeding device' means a magazine, belt, drum, feed strip, or similar device manufactured after the date of enactment of the [ban] that has a capacity of, or that can be readily restored or converted to accept, more than 10 rounds of ammunition" except for attached .22 cal. tubular magazines. 4. AWs made and legally within the U.S. on or before Sept. 13, 1994, and "large ammunition feeding devices" made (not necessarily imported) on or before that date, are "grandfathered" (not banned). 5. See discussion of H.R.2038/S.1431 and S.1034 on pg. 4, and www.nraila.org/Issues/Filter.aspx?ID=019. _safesec.asp). To the contrary, the grip is shaped to conform to the shape of the stock, relative to the barrel. 7. Springfield and Remington Model 1903s, M1 Garands, Mausers, Lee-Enfields, Pattern 17s, Mosin-Nagants, etc. 8. Roth, Koper, et al., Urban Institute, "Impact Evaluation of the Public Safety and Recreational Firearms Use Protection Act of 1994," 3/13/97 (www.urban.org/UploadedPDF/aw_final.pdf). 9. Reedy and Koper, "Impact of handgun types on gun assault outcomes," Injury Prevention, Sept. 2003. 10. Gary Kleck, Targeting Guns, 1997; Dave Kopel, "Rational Basis Analysis for 'Assault Weapon' Prohibition" (www.davekopel.com/2A/LawRev/rational.htm). Bureau of Justice Statistics: Survey of State Prison Inmates 1991 (3/93), Guns Used in Crime (7/95), Firearm Use by Offenders (11/01) (www.ojp.usdoj.gov./bjs/pubalp2.htm). 11. Kleck, p.112. Basis: National Crime Victimization Surveys, which identify many crimes not reported to police. 13. "Assault Weapons in America" (www.bradycampaign.org/facts/issues/?page=aw). 14. California's murder rate increased every year for five years after its 1989 ban, 26% overall, while increasing 11% in the rest of the nation. Since its 1998 ban, its murder rate increased 3%, decreasing 12% in the rest of the nation. 15. Crimes reported to police (http://bjsdata.ojp.usdoj.gov/dataonline/Search/Crime/Crime.cfm and www.fbi.gov/ucr/ucr.htm). 16. 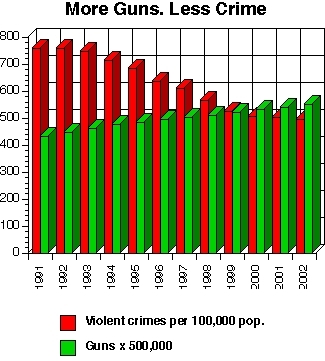 Bureau of Justice Statistics, "Criminal Victimization 2002" (www.ojp.usdoj.gov./bjs/abstract/cv02.htm). 19. As AWs were debated, demand and production increased. So many were made, new ones are still available. On CBS "60 Minutes" ("What assault weapons ban?," 2/5/95), Lesley Stahl reported, "Assault weapons are still . . . . being sold by the thousands." 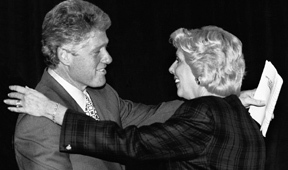 Calling 1994 "the best year for the sales of assault weapons ever," she dismissed as "a good applause line" Clinton's claim that the ban reduced AWs. 21. Ex. : "Trace requests for assault weapons in the 1993-95 period declined 20% in the first calendar year after the ban took effect" ("The Assault Weapons Ban: FAQ," www.bradycampaign.org/facts/gunlaws/awb.asp). 22. "Assault Weapons": Military-Style Semi-Automatic Firearms Facts and Issues, May 13, 1992, 92-434 GOV. 25. See Notes 6 and 13, and "Statement of Michael Barnes on Senate and House Assault Weapons Legislation, May 9, 2003 (www.bradycampaign.org/press/release.php?release=476). 27. BATF prohibited such rifles having one attachment. The Clinton ban allowed comparable rifles to have one attachment. (Note 3.) ("Report and Recommendation of the ATF Working Group on the Importability of Certain Semiautomatic Rifles.") In 1998, BATF prohibited importation of any such rifle capable of using a military magazine over 10 rounds capacity (www.atf.gov/pub/treas_pub/assault_rifles/index.htm). 29. For home protection, many people configure shotguns with 20-in. barrels, magazines that hold one or two additional shells, and pistol grips. 31. FBI "Law Enforcement Officers Killed and Assaulted" reports (www.fbi.gov/ucr/ucr.htm). 32. "Assault Weapons in America" (www.vpc.org/studies/awaconc.htm). Polls showed the public overwhelmingly opposed to handgun bans. Mass. and Calif. voters had rejected handgun ban referenda. The handgun-ban lobby changed its name to Handgun Control and abandoned gun-ban rhetoric. President Reagan had signed the Firearms Owners' Protection Act, prohibiting federal gun registration, which Brady Campaign considers prerequisite to a ban. 33. Most guns affected by the ban's magazine limit are handguns that are not AWs. And while the ban exempts 600 guns, it exempts no handguns. 34. A gun Jenne claimed was semi-automatic was shown rapid-fired at cinder blocks and a bullet-resistant vest, destroying both. In fact, the gun was a machinegun. 35. Deputies shot a melon with an AK-47, to no effect. They then exploded the melon by shooting it with a handgun loaded with expanding bullets. The edited video showed the AK-47 fired, followed by the melon exploding. The Zarella/Jenne video was edited to show a non-AW fired at the blocks and vest without effect. It was later revealed that while the camera was focused on the blocks and vest, the gun was being fired into the ground. 37. "Bullet Hoses" (www.vpc.org/studies/hosecont.htm). Even the cover photograph is of a submachinegun. 38. For a discussion of the Framers' views on the defensive uses of arms, see Don B. Kates, Jr., "The Second Amendment and the Ideology of Self-Protection," 1992 (www.constitution.org/2ll/2ndschol/53-2nd.pdf). 39. Thirty-eight state constitutions declare security or defense as one reason, or the reason. Six others protect the right generally. See www.nraila.org/Issues/factsheets/read.aspx?ID=63 fact sheet. 40. Gov't personnel are armed because they are authorized, not because of a "right." Also, seeU.S. v. Emerson: The right belongs to "those not then actually a member of any militia or engaged in active military service or training" (www.ca5.uscourts.gov/opinions/pub/99/99-10331-cr0.htm). See www.nraila.org/Issues/Filter.aspx?ID=010. 41. U.S. v. Miller (307 U.S. 174, 1939). 42. Standard magazines for service rifles hold 20 or 30 rounds, while those for service pistols hold fewer than 20. 43. Office of the Assistant Secretary of Defense for Reserve Affairs. 44. Remarks on Assault Weapons Ban, at the Rose Garden, White House, April 6, 1998. 45. Dennis Henigan, USA Today, 11/20/91; Sarah Brady in "Keeping the battle alive," Tampa Tribune, 10/21/93; Pete Shields, Guns Don't Die - People Do, 1981; Jim Brady, "In Step With: James Brady," Parade Magazine, Washington Post, 6/26/94; Comments to the Department of Transportation, 2/12/02. 46. "Gold Medal Gunslingers" (www.vpc.org/studies/goldcont.htm). 47. Congressional Record, Nov. 9, 1993. 48. CBS 60 Minutes, Dec. 5, 1995. 49. Donna Dees-Thomases, "Unheeded lessons of Columbine," Philadelphia Inquirer, 7/17/02.